If I know anything about myself, it's that I am a girl who likes routine. My morning starts the same way everyday, if I find a sweater I love, I buy it in three colors, and I always always always get my custom holiday cards from Minted. This is my third year getting our holiday cards at Minted (and yesterday happened to be my 3rd wedding anniversary!). Since we got married December 1st, and I knew I wanted to have a few wedding photos for our first holiday card, I started the tradition of sending New Years cards instead of Christmas cards. Even though that means our holiday cards come a little after the rush, I know that it also means that our friends and family get snail mail later in the holiday season. Gotta stretch the holiday spirit, right?! Minted offers tons of customization options. Every card usually offers several colorways, and you can always change the text. This year, I noticed more cards than ever before can be designed with sayings like "Happy Holidays" or "Happy New Year." It's great to see options that fit everyone's beliefs and traditions. The card I chose this year can be done in six different colors or six different foil options. It comes in postcard size, petite size (4.5 x 6), or classic size (5 x7). You can choose rounded corners or square, and there are several options for the back and for envelop colors. So. Many. Possibilities! Perhaps my favorite part of using Minted for custom holiday cards is that they print envelopes for you. Envelopes always stress me out, so it's a huge relief not to have to handwrite all of them. Instead, I can add a custom note to the back, or if I'm being totally honest, place a stamp on the coordinating envelope, pop it in the mail, and call it a day. 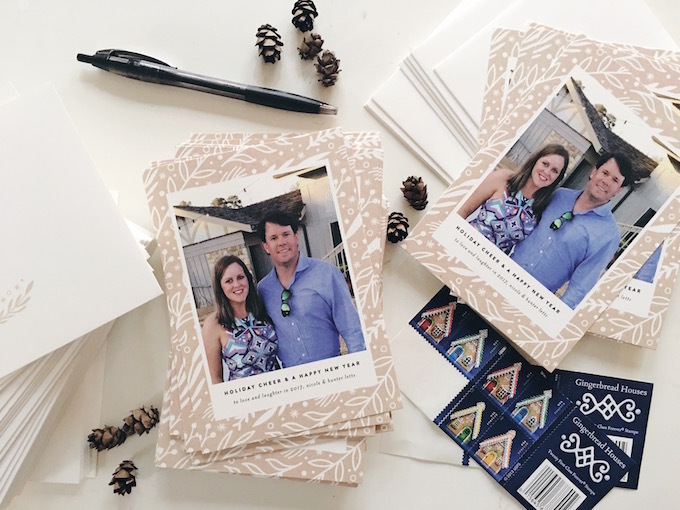 If you're still in the market for holiday cards, be sure to check out Minted. They're often running sales and specials, and their gorgeous quality can't be beat. For now, enjoy a sneak peek at our 2017 New Year's cards. P.S. If you're not quite sure how to write your name on your Christmas cards, this guide will answer all of your questions. Bottom line: no apostrophes catastrophes. I received my holiday cards in exchange for this post, but all opinions about this brand are my own!